We are situated on the sandybanks beside the beach & Keel's new state of the art playground. The Cottages are just a few minutes walk from the shop, restaurants, bars and golf course. Summer Schools & watersports are based at Keel Lake & at the beach beside us. 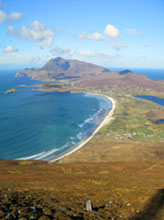 Access to some of the finest walks in Ireland is possible directly from Beach Cottages. Park your car and have a real rest on this beautiful Island. Bookings for 2019 e-mail Complimentary WiFi service exclusive to each cottage. Nights marked RED are booked. © Copyright 2018 to 2019 Sean Cannon. All Rights Reserved.